Are you looking for a bat control expert in Michigan or other regions in the United States? We are here to help you find a bat problem specialist for your needs and concerns. I have seen how hard it is to find a professional in many areas of Michigan and believe it is just as difficult to find a specialist to deal with your problem in other states. Here at VaMoose Varmint, the bat professionals of Michigan we are ready to help you understand the concept of the bat control process. We will show you what’s and whys, and then utilize our knowledge to resolve your problem. We are positive our techniques will work on your bat problem. VaMoose Varmint Wildlife Services guarantees our services to give you piece of mind. Rodents are the most numerous mammals both in numbers of species and individuals. In second place comes the bat species. Keep in mind that bats are not rodents. There are 47 known bat species here in North America. Keeping this in mind there is a chance that somewhere or someplace there will be a bat problem where people and bats do not coincide. So this is where the experts can help you with your problem. We will use proven bat control methods to evict the bats. Some bats are protected or threatened, like the Indiana bat in Michigan and should not be harmed. Bats are beneficial to our surroundings and should be dealt with in respect. The issue is looked at by a trained specialist as simple. Excluding everything on the structure that a bat could possibly enter, then install an eviction device allowing the bats to exit unharmed, but not find their way back into the structure. This is easier said than done. Openings the size of a dime will allow a bat to find their way into a structure. This is where the bat control pro plays a major role. The technician’s attention to detail on a problem is crucial when performing an inspection. Failure to do so will leave area’s unnoticed for a new problem to occur. We have found this method to be repeatable on a bat problem without causing injury to the bats during the process. This method is also approved by Bats Conservation International. Getting rid of bats should be done only at certain times during the year, spring time before June and after August. These are approximate dates for proper control of bats. Experts in your area will know when the bat colonies begin forming in your area. Most bats living in northern parts of the continent will hibernate for the winter when their food source (insects) is no longer active. Some bat species migrate south where the bats remain active and feed all winter. Unlike some hibernators bats awaken quickly during warm or extreme cold spells, a bat will awaken and move around looking for the right temperature so they can go back to sleep. This is why you may hear noises in your ceiling or walls during the winter months. This time of the year is not the right time for safe bat eviction, or to have any form of bat control to be performed. 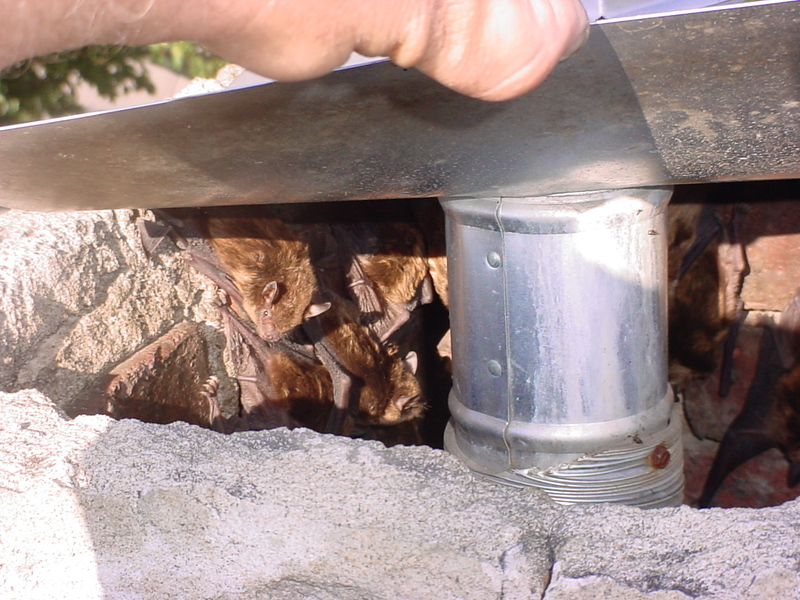 There are other bat control techniques like bat trapping. The difference is instead of eviction devices bat traps are installed capturing the bats in an enclosed space not allowing the bats back into the structure. A bat trap can be fatal to a bat if they are not removed from the device in a timely manner. The trapping process is inhumane to the bat not removed in a timely manner due to over crowding and heat stress. Traps expose the trapper to another bat problem, imposing a greater risk to potential diseases. Traps may also result in more charges due to the technician having to check the traps on a daily basis. Relocating the bat problem may not work, the bats may find their way back to the roost. We are not bat exterminators, we are bat control professionals and do not use bat poison on the animal, and it’s illegal and unethical for a bat problem solution. Also there are no registered bat poisons made for a problem. We evict the bats from the structure, your home, business or other buildings using one way doors, and through a bat exclusion process, sealing all possible entry points to resolve the bat problem. We do not use electronics as a repellent on a problem. These quick fix electronic bat control devices do not always work 100 percent to solve the problem. I’ve been in attics where the home owner has tried several electronic devices, with all of them plugged in to an operational outlet around a bat roost, and they had no effect on the bat problem in that area. I have also seen bat repellents hung all over attics, and by the entrance holes. To no surprise there was no effect on the problem. Most repellents contain naphthalene or commonly called moth balls, to be effective on a bat problem you would have to use great quantities to the point it would be toxic to humans. When performing bat control you must think safety first. High ladder work can be dangerous when resolving a bat problem. A six foot fall from a ladder has been known to kill a human during a fall. During the summer and early fall months stinging insects may be present when working on a bat exclusion. We use climbing harnesses to aid in climbing steep roof pitches. A good tree climbing system is a very good investment when working a bat eviction. On bat jobs that warrant it we will rent a self propelled man lift. Several years ago we attended a rabies conference in Lansing Michigan. There was a lecture on bat problem species where someone in the auditorium asked "how to get rid of bats from my home"? This expert that studies bats gave this bad advice to the audience, "seal the point where the bats are flying out from when they leave to feed". Needless to say we were floored. We tried to talk to him afterwards about his techniques but he insisted that he new what he was talking about. This advice sounded good and simple on a bat issue, but we know from seeing this done by others that it does not work for removing bats in the attic. We have had to deal with this type of problem, by re-opening the entrance holes and installing one way doors. While opening these holes I’ve seen bats right there wanting out, after being trapped for days. Sealing the bats in with out an exit will most likely result in the colony dieing inside the structure or a handful of the bats finding their way inside the structure where you don’t want them resulting in a possible flying bat problem, or a bat rabies exposure. WHAT IS AN EVICTION DEVICE? We have our own design we make right at the job sight for a custom fit on a home. These one way bat control devices are left on for a week or two even longer depending on the work load, then removed and the hole sealed called bat proofing. Bat eviction devices on gable end vents that have the bug screen breached may use netting or other similar materials for proper eviction on a bat problem. Thank you for visiting Pro Bat Control web page. We offer referral for services in these states: Alabama, Alaska, Arizona, AR / Arkansas, CA / California, Colorado, Connecticut, Delaware, District of Columbia, Florida, Georgia, Hawaii, Idaho, Illinois, Indiana, Iowa, Kansas, Kentucky, Louisiana, ME / Maine, Maryland, Massachusetts, MI / Michigan,MN / Minnesota, Mississippi, Missouri, Montana, Nebraska, Nevada, NH / New Hampshire, New Jersey, New Mexico, NY / New York, NC / North Carolina, North Dakota, OH / Ohio, Oklahoma, Oregon, Pennsylvania, Rhode Island, South Carolina, South Dakota, Tennessee, Texas, Utah, Vermont, Wisconsin, Virginia, Washington, West Virginia, Wyoming. Big Brown Bat: Professionals deal with this bat all the time. These bats circulation is in Alabama, Alaska, Arizona, Arkansas, California, Colorado, Connecticut, Delaware, District of Columbia, Florida, Georgia, Idaho, Illinois, Indiana, Iowa, Kansas, Kentucky, Louisiana, Maine, Maryland, Massachusetts, Michigan, Minnesota, Mississippi, Missouri, Montana, Nebraska, Nevada, New Hampshire, New Jersey, New Mexico, New York, North Carolina, North Dakota, Ohio, Oklahoma, Oregon, Pennsylvania, Rhode Island, South Carolina, South Dakota, Tennessee, Texas, Utah, Vermont, Wisconsin, Virginia, Washington, West Virginia, Wyoming. This species is a major bat nuisance and typically requires the need of a bat problem specialist to provide bat control. Gray Bat: Florida, Alabama, Arkansas, Georgia, Indiana, Illinois, Kansas, Missouri, Kentucky, Tennessee, Oklahoma . Indiana Bat: Connecticut, Arkansas, Georgia, Indiana, Illinois, Iowa, Maryland, Kentucky, Michigan, Missouri, Mississippi, New Jersey, North Carolina, New York, Ohio, Pennsylvania, Oklahoma, Tennessee, Virginia, Vermont, West Virginia. Ozark Big Eared Bat: Oklahoma, Arkansas. Virginia Big Eared Bat: North Carolina, Kentucky, West Virginia, Virginia. Lesser Long Nosed Bat: New Mexico, Arizona. Mexican Long Nosed Bat: Texas, New Mexico. © Vamoose Varmint, LLC. All Rights Reserved. All images, text, graphics and materials are protected by U.S. and International copyright laws on Pro Bat Control. "Thank you for the services you have provided, we can now sleep at night knowing the bats are not flying around in our home"
"We did not know how to remove bats on our home, we are happy that we hired VaMoose Varmint to remove the bats"